Clean code – what next? ***Good code is like a good joke – is needs no explanation. *** Today we are going to talk about two another aspects of clean code. First of them are comments. Use them or not to use them – that is the question. #Good comment, bad comment Comments are a real double-edged sword. Nothing can be quite so helpful as proper-placed comment. Nothing can be quite so damaging as deprecated comment that preaches untruth and disinformation. Programmers often disagree about comments role – they are pure good or necessary evil? I our case C# is a lot expressive language so we would not need comments very much to express our intent. It is fact that programmers often use comment to do fast makeup for bad code. This solution is like an adhesive tape – fast and easy though only for a moment. Unfortunately bad code even with beautiful makeup is still ugly bad code. Next time against comment confusing code just better clean it! For example: ``` //Check to see if the player done lethal hit to enemy below 30 hp if(enemy.healthPoints < 30 && isCritical) … ``` If you will use separate function, your comment becomes unnecessary. In many cases better idea is to create a function that says the same thing as the comment you want to write. However some comments are necessary or favourable. //Copyright © 2017 by University of Games sp. z o.o. All rights reserved. Clarification – of course always better is find way to argument or return value be more readable. But sometimes when we use some kind of external libraries that you cannot modify, comment can be very useful. //Do not use it every frame. Use only if is necessary! Closing brace comments – sometimes programmers will put comment on closing braces as below. This behaviour creates only chaos. IDE tells us which brace is on pair with selected one. Commented-out code – please, don’t do this. Old commented code is like an old dust. Other programmers don’t know if those commented lines of code are important or not. Probably they leave it commented. Next time don’t hesitate and remove unused code. You can always go back to it using source code control systems like git. Abstraction – allows us to represent complex real world in simplest way. It is a process of identifying the essential features and behaviours an object should possess. Encapsulation – is a process of hiding all the internal details of an object from the outside real world. 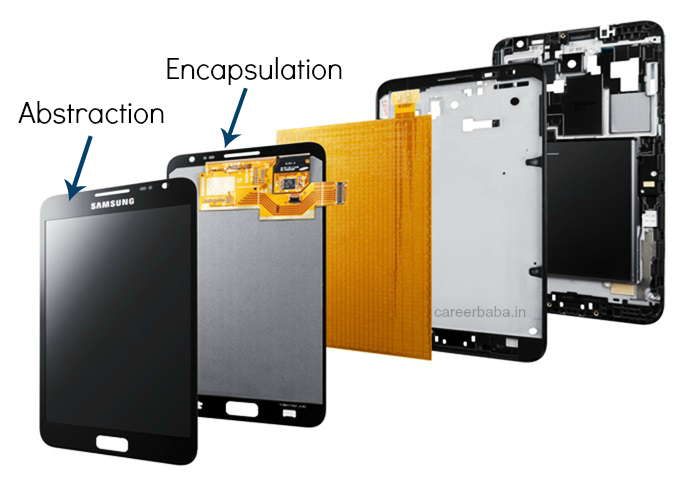 “Encaplsulation” is like “enclosing” into a “capsule”. It restricts from watching its internal view where abstraction behaviour is implemented. Any archer can shoot, because it implements IShootable ‘feature’. Having a group of shooters (list) this means that both Archer and Gunner are valid choices. So you can have lots of implementors with plenty of properties and methods, but in this scenario what matters is their ability to Shoot. This is abstraction. Since shooting requires some steps (LoadArrow etc. ), these are hidden from the view as they are an internal concern of the class. The Archer has many other public behaviours which can be called by the outside world. But some details will be always hidden because are related to internal working. They’re private and exist only for the object, they are never exposed. This is encapsulation. There is a dirty little secret of code comments: to write good comments you have to be a good writer. Comments aren’t written for the compiler but for other people. Writing good, meaningful comments is hard, like an art of writing the code itself. In most cases if you feel your code is too complex to understand without comments – your code is probably just bad. The earlier you start rewrite it, the less effort is needed to get good results. Objects expose behaviour and hide data. This makes it easy to add new kinds of objects without changing existing behaviours. Using of abstraction makes life easier. We don’t need to worry about update copypasted code from another class. The best solution is to write code in way where we need change code in only one place to update existing behaviour. I hope that you have enjoyed clean code rules. To learn more about clean code we recommend you excellent book written by Robert C. Martin: “Clean Code: A Handbook of Agile Software Craftmanship”.